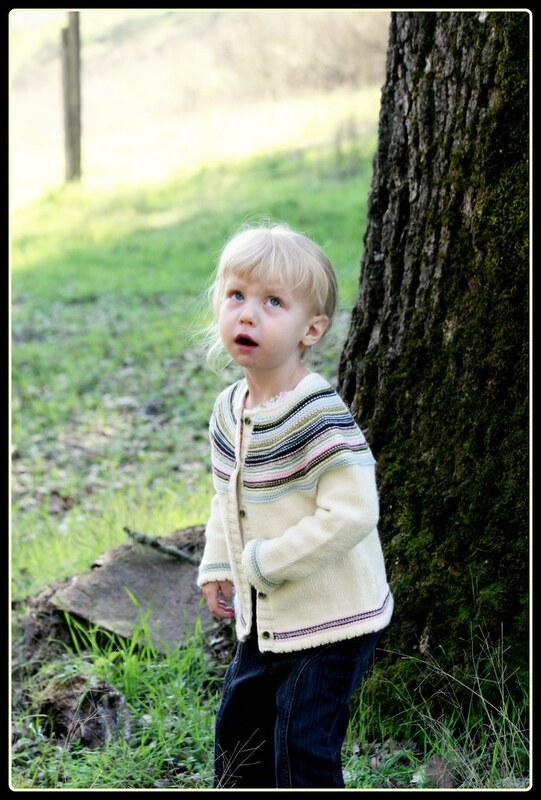 I finally finished the Playful Stripes Cardigan for my little one! There is just one thing I'm mad at myself about. I wish that I had made it one size smaller. I have a tendency to forget just how petite my daughter really is! I thought she was right in between a 2T and 3T, so I chose the 3T. Yea... Should have gone with the 2T. 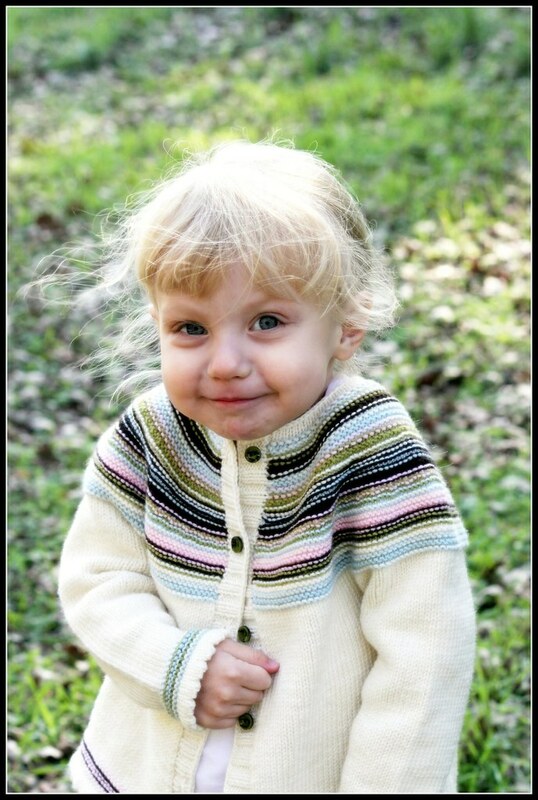 I want to assure you that this pattern is sized appropriately, I just chose the wrong size to knit for my daughter! Ahh well... it will fit her correctly next year! 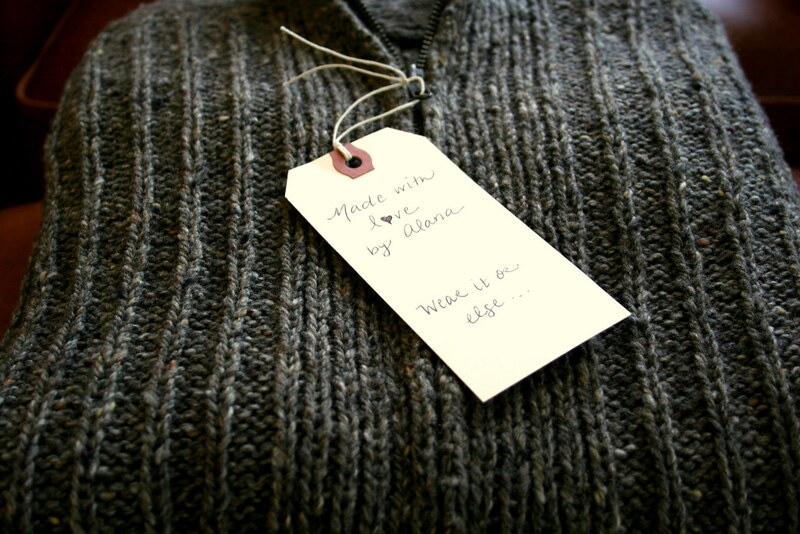 I chose the name "Playful Stripes" for this sweater because I love the way the colors "play" together in the stripes. It's interesting because the color brown can look one way next to pink and take on an entirely new hue and identity paired with green. 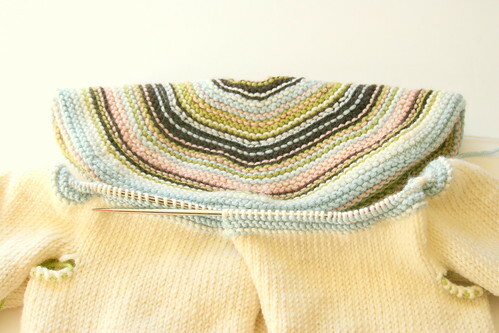 It was fun to pair up and play with all of the colors as I was striping the yoke. I also like how the reverse side of garter st splits the colors up. 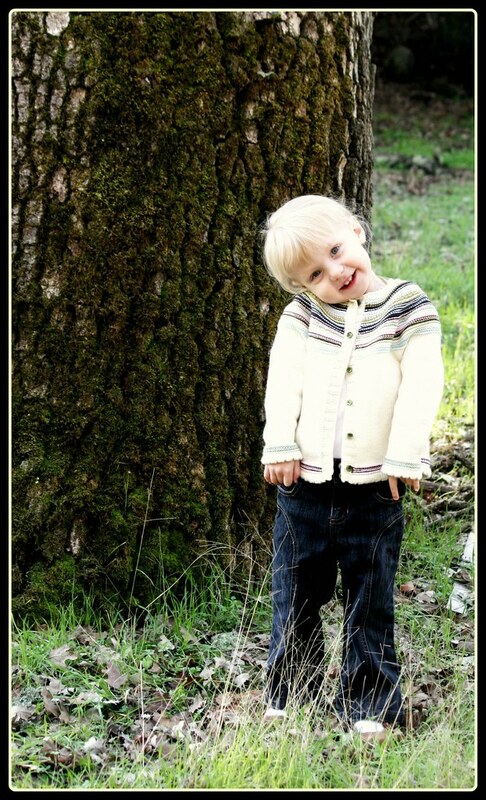 Did you know that 3 year olds make for extremely high maintenance models? Hi Mommy! I love you and my new sweater! To this.... in under 5 minutes. I'm hungry AND I have to go potty!!! 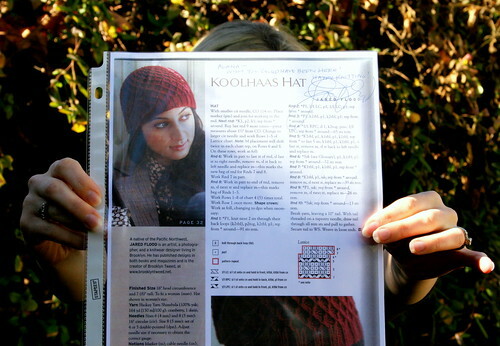 Here is some pattern information for those of you who might be interested in knitting it. 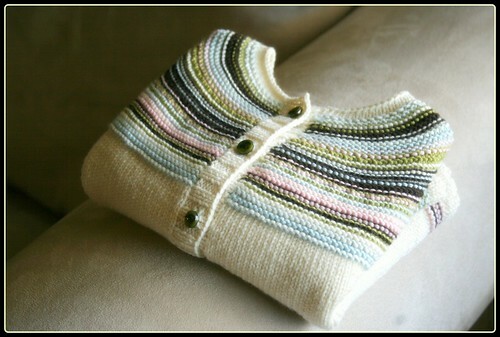 I chose Debbie Bliss Baby Cashmerino for my daughter's sweater. 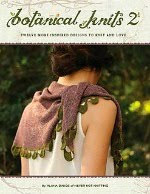 I love this yarn because it is very very soft and it contains wool and cashmere making it very very warm. Also it can be machine washed which is such a necessary option to have with children. But of course any sport weight yarn that gives you the correct gauge will do. 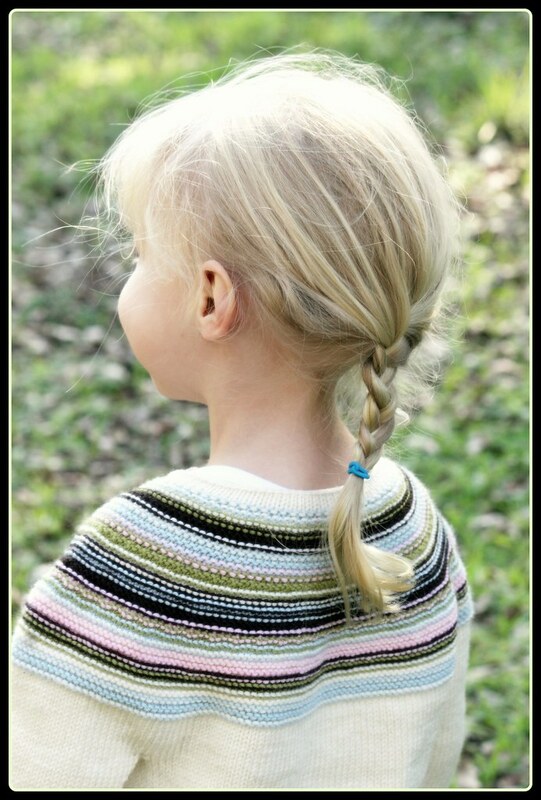 This could be a great opportunity for you to use up scraps, as I did, because you only need small amounts of each color for the striped sections. To all of you knitters who are morally against finishing work: This sweater is constructed in a way that requires minimal seaming. The only seam that needs to be sewn up in the end is the sleeves. 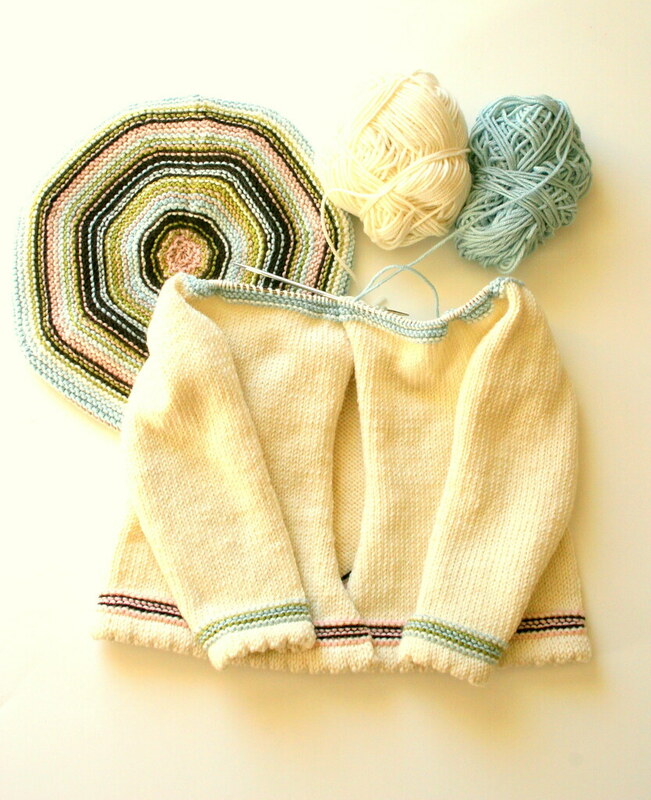 The sleeves could easily be modified to work in the round, but I found for myself it was easiest to knit them flat because of the striped border on the cuff. 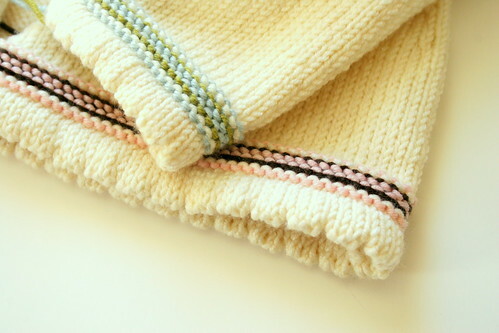 The pattern is knit from the bottom up in one piece. 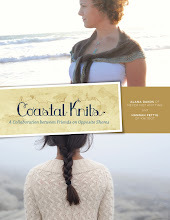 You first knit the body, then the sleeves, and then join them all together for the yoke. I really enjoyed this method of construction! I hope that you will enjoy it too! Just in case you are wondering where episode 12 of the NeverNotKnitting podcast is.. dont worry! Its coming! Starting in February I will be on a new podcasting schedule. I will be releasing a new episode on the 1st and 15th of each month. I have been doing so much knitting lately.. work knitting.. so I haven't had much to show for my efforts except swatches. 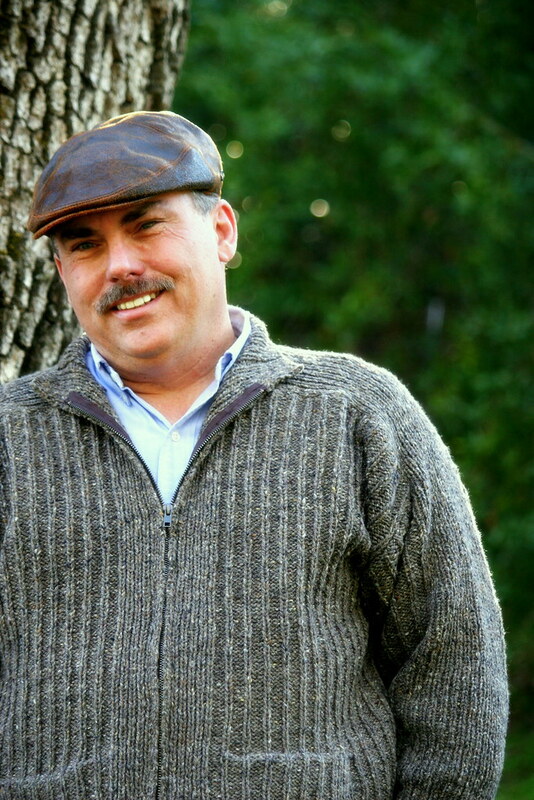 Ok, so actually I finished this sweater a few days ago, and hope to have the pattern available very soon. I dont want to show you the finished product quite yet, but here is another 'work in progress picture' so you can see how it all came together. I liked this cardigan so much more the more I knit on it. The stripes really brought it all together in my opinion, and it turned out pretty cute! And dont worry! The armpit holes are not a design feature, but are sewn together later! Don't be alarmed! You are at the right blog! I am so excited about my new Never Not Knitting logo! What I had up there before was just..sad.. It was time for a change. The graphic designer that designed my logo for me is super talented and very nice and easy to work with. Youll find her blog and design portfolio here. So I finally gave my Dad the long awaited sweater. ...And he likes it! What a wonderful ending to this project! I am so very pleased by how the sweater turned out! The design is very nice and very wearable. 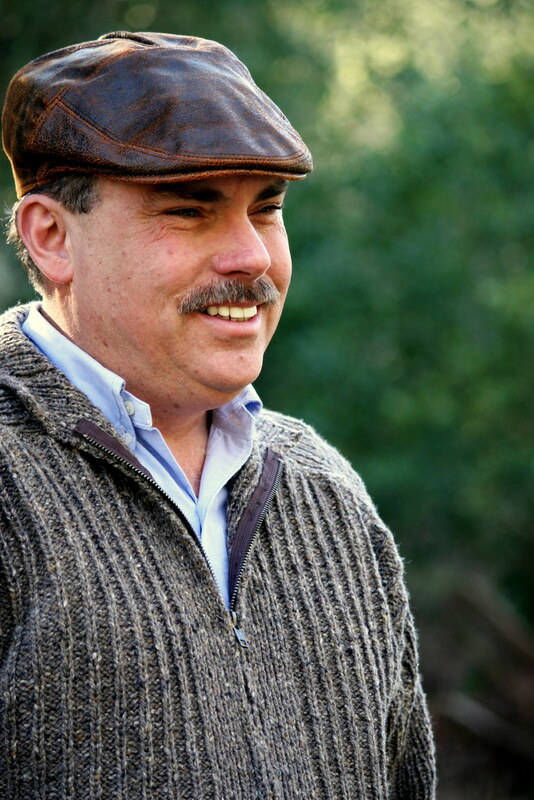 Its not too "fancy" or "silly looking" as men's sweaters can often be. 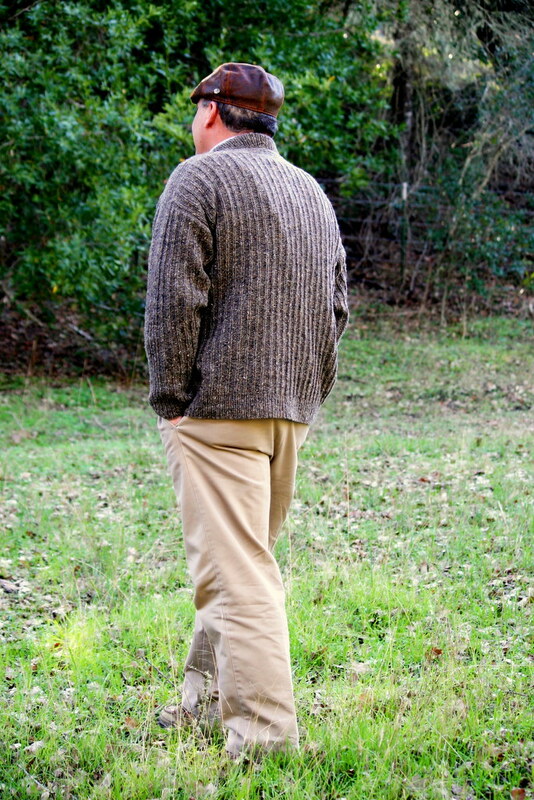 This pattern, paired with the Kathmandu Tweed yarn, makes for a wonderful rugged looking cardigan. This was my first time working saddle shoulders. 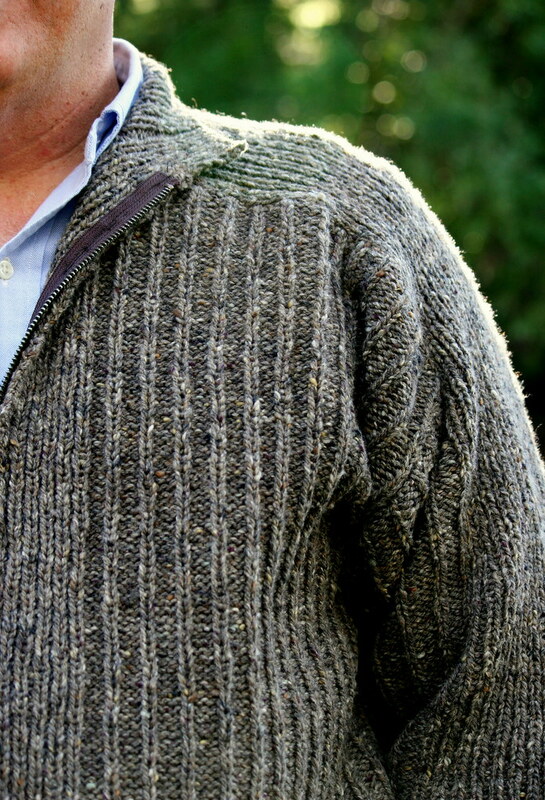 I really like the look of them and I think that this sleeve construction lends itself well to a masculine sweater. Hardly any men like a set in sleeve and this is a nice variation to the classic drop shoulder style. I'm so glad that I found it when I did! I am so happy with this project! And also sooo proud of myself for sticking with it even through the trying times. 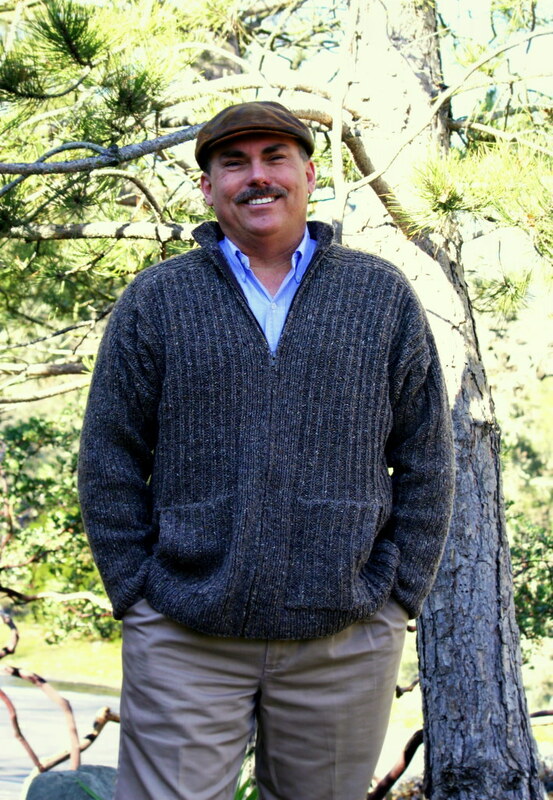 "The Dad Sweater" has returned newly improved with a zipper sewn in. Time to finally give it to "The Dad" it was intended for! If you know me personally you already know that I have a slight but ever growing obsession with Jared Flood. He happens to be one of my most favorite bloggers and a fabulous designer to boot. So you can see why I was ecstatic when my friend Audrey brought this back for me from a class she attended of his in Portland, Oregon. No. Its not just a pattern, people. He wrote on it. Ok. Yes Brooklyn Tweed himself wrote me, Alana, a message. Well. Here it is. My first sweater design. In progress. Truthfully, I'm not sure how I feel about it. 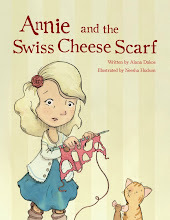 My inspiration for this design was the cute stripey beret I made for my daughter. 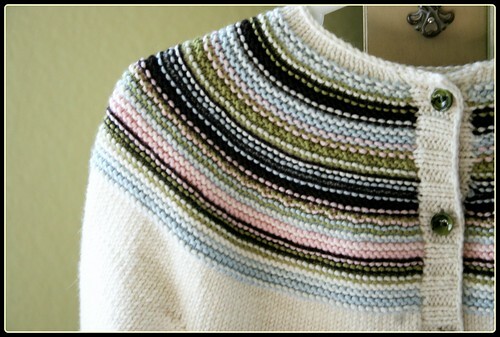 I just love how the colors blend together and wanted to mimic the stripes in a matching sweater. Right now I am working on the yoke, which will be striped, just like the beret, pulling together the border colors on the body and sleeves. Here it is all laid out with the beret so that you can get an idea of what the finished piece will look like. 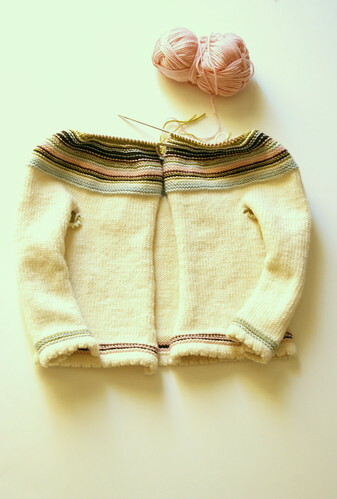 Sometimes I think that this little sweater will be adorable once finished. Other times I think it may be the grossest thing I've ever laid eyes on. It's hard to visualize a garment while it's in production. 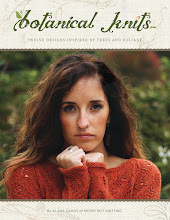 Several times I have knitted a sweater for myself and hated it when it was on the needles. Then once it is seamed, blocked with buttons sewn on it transforms into something quite amazing. I haven't given up hope for this one. If it turns out well you can expect to see it in completion modeled by a little person and the pattern will be available for purchase.